(627, Carlton Ross Hume Collection, OHS). The Kadohadacho, often referred to as the "Caddo Proper," lived in a cluster of villages at the great bend of the Red River or Bah'-hat-te-no in what is now southwestern Arkansas, northeastern Texas, and southeastern Oklahoma at the time of Anglo-American contact. Their successful towns thrived on preserved food surpluses, in the forms of corn, beans, squash, and pecans, and manufactured goods for domestic use and trade, including bows and pottery. The Kadohadacho preserved the northern reaches of the Caddo country from modern foes such as the Osage and the Quapaw who attempted to raid the Red River settlements for their wealth. Central to Kadohadacho identity is their native language. Kadohadacho thought represents a sophisticated, action-centered means of expression. The basic feature of the verb complex is the stem. All Kadohadacho verbs exist in inclusive form, being inflected for person, case, and reality, with exceptions. The minimal verb structure includes the stem, indicating tense/aspect/mood. An example of a Kadohadacho idea expressed in sentence form may be stated as: hiyci-wida bin nidun, or "I above hanging hit ball," or "I hit the ball in the air." Person, case, and reality distinctions in Kadohadacho or Caddo are indicated by the pronominal prefixes to the verb stem. Assessment of truth is important in Caddo speech. The linguist Lynette Melnar suggests that "reality is a semantic property of the event or state expressed by the clause. Reality distinctions are motivated by several interrelating factors, the functional basis being the degree to which speakers; judgments of particular situations correspond with their notions of objective reality." All names of people, places, and things are stated and thought of in action in Caddo, as these are noted in construction marking the verb stem. As the Kadohadacho increased their contacts with the Spanish, French, and then the Anglo-Americans, they became multilingual in these European tongues as well as in those of the neighboring tribes along the Texas-Louisiana frontier. In building alliances they found strength against the invading Osage. For a time the Caddo remained strong both culturally and numerically in terms of population. They maintained themselves as one of the most influential tribes. U.S. agents and expeditionary teams were on the scene quickly after the 1803 Louisiana Purchase. They realized the influential position of the Kadohadacho. The Hasinai were located to the south, in Spanish territory that became Mexican in 1821. The United States sought the allegiance of the Kadohadacho in regional Indian affairs. Dehahuit, a Kadohadacho caddi, the highest leadership position among the Caddo, negotiated in good faith with the United States. The caddi was a hereditary position, and Dehahuit was well respected by the people for his ability to govern in peace and harmony. He worked for the Kadohadacho people in the first decades of the nineteenth century. Trade relations served the people well, although contact with Europeans and Anglo-Americans brought on disease and death on an ever-increasing scale. Epidemics took large numbers of Caddo people because they did not have resistance to new diseases, including smallpox, measles, influenza, malaria, and others, brought to the Americas by the Europeans. It became increasingly difficult to hold military, economic, and civil structures together within the Kadohadacho communities. As the tribal fabric was weakened, encroachment by Anglo-Americans rapidly increased. In the 1830s a new caddi, Ta'sha, emerged. He was not as decisive as Dehahuit. In 1835 the entire Kadohadacho people, along with remnants of the Natchitoche community, with the leadership of Ta'sha, agreed to remove themselves at their own expense from the United States to Mexico within a year's time. In Mexico, in the province of Texas, they hoped to live among the Hasinai confederacy. The Kadohadacho were compensated for their lands in Louisiana in the amount of eighty thousand dollars in the Treaty of 1835 with the United States. This was complicated by the Texas Revolution of 1836, which made for added hardship. The Kadohadacho were removed to the Brazos Reservation in West Texas along with the Hasinai in 1845, as Texas became a state in the Union. In 1859 the Caddo people were removed again to the Indian Territory, where life was immediately disrupted by the failure of the democratic government of the United States in the Civil War. In the postwar Reconstruction period the Caddo were concentrated on the reservation between the Canadian and Washita rivers on the Great Plains. With a reversal of policy the United States broke up the tribal lands into individual allotments through the Dawes (General Allotment Act) legislation in 1887. Whitebread, the Hasinai leader, spoke of the Caddo and Wichita people stating that "because of their peaceful lives and friendship to the white man, and through their ignorance were not consulted, and have been ignored and stuck away in a corner and allowed to exist by sufferance." In 1902 some land was allotted to Caddo individuals and placed in trust. 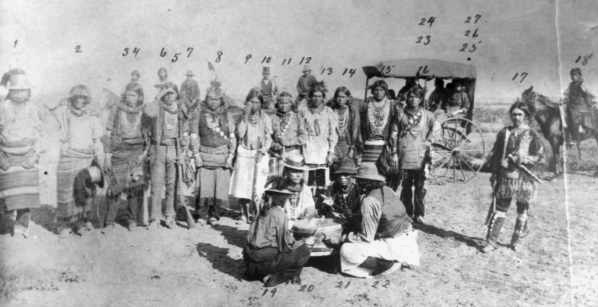 In 1938, under the provisions of the Oklahoma Indian Welfare Act of 1936, the Kadohadacho, the Hasinai, the Hainai, and others constituted themselves with the establishment of the government known as the Caddo Indian Tribe of Oklahoma. This system of governance, led by such significant elected tribal chairpersons as Melford Williams, Harry Guy, Hubert Halfmoon, and Vernon Hunter, continued into the twenty-first century with its administrative center near Binger. At the beginning of the millennium, LaRue Parker served as the tribal chairperson. The Caddo maintain their tribal traditions in dance, song, story, and art. Their efforts in preservation of language and thought enhance the quality of life of the tribal members. Cecile Elkins Carter, Caddo Indians: Where We Come From (Norman: University of Oklahoma Press, 1995). Cecile Elkins Carter, "Caddo Turkey Dance," Remaining Ourselves: Music and Tribal Memory: Traditional Music in Contemporary Communities, ed. Dayna Bowker Lee (Oklahoma City: State Arts Council of Oklahoma, 1995). George Dorsey, Traditions of the Caddo (Lincoln: University of Nebraska Press, 1997). Howard Meredith, "Cultural Conservation and Revival: The Caddo and Hasinai Post-Removal Era, 1860–1902," The Chronicles of Oklahoma 79 (Fall 2001). F. Todd Smith, The Caddo Indians: Tribes at the Convergence of Empires, 1542–1854 (College Station: Texas A&M University Press, 1995). John R. Swanton, Source Material on the History and Ethnology of the Caddo Indians (Norman: University of Oklahoma Press, 1996). Howard Meredith, "Caddo (Kadohadacho)," The Encyclopedia of Oklahoma History and Culture, https://www.okhistory.org/publications/enc/entry.php?entry=CA003.